The website is under construction. If you can't find what you're looking for, please check back soon or contact us. Interested in helping? Take any of our Community Input Surveys that apply to you! 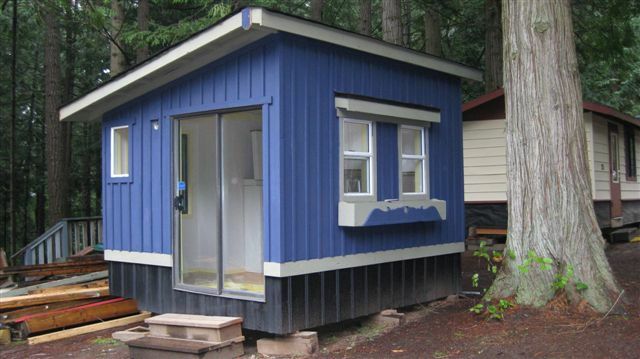 The Land Bank is working on a pool of Community Cottages, small (max 12’-22’) buildings that are easily transportable in a commercial truck (thanks Slegg). These cottages would then be placed on a host property and a rent, capped at a price affordable to the tenant, would be paid to the host. If the host property was no longer available (if it were sold, for example) the tenant would have the option of moving their home to another available property. . Based on support from the official community plan The Land Bank proposes to create a pool of these Cottages. The Land Bank would then administer the pool and imagines a flexible policy where tenants and hosts choose one another, collaborate on the parameters of a tenancy agreement, and then rent is paid directly to the host. 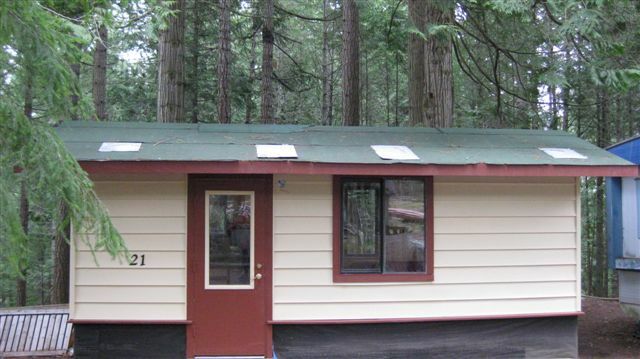 Since the host provides only land, the rent can be capped at an affordable price, filling a much needed gap in the Salt Spring rental market. This arrangement provides security, stability and a sense of autonomy to the tenants and a regular income to the host. The movable nature of the cottages creates the potential for people to live in their home for the rest of their life. The The Land Bank built two buildings in 2011 under a ‘Back to Work’ Program from the Federal Gov’t, using recycled items (from Mary Hawkins Library and others) and new materials supplied by the Land Bank. These buildings were displayed at Gulf Islands Secondary School from July 21st to July 28th where members of the community came by to look at them and talk about design and implementation. Though it may take some time to have a sufficient pool of Community Cottages, this is a start. We see this as a possible solution for other rural areas and even cities. The cottages could also be used for a Wagon Wheel model of supportive housing when land becomes available. What better place to give it a try and work out the kinks than Salt Spring? We are still looking for feedback from the community! If you have ever wished for a small place to call your own; heaved a wistful sigh when moving for the second time in the course of a single year; spent the winter months dreaming up designs for tiny houses; wondered if an extra income wouldn’t be just the thing to help with the mortgage (if only there was space for a tenant); or are interested in housing bylaws, the growing gentrification of the island, or your neighbours in any way, then we want to talk to you. If you missed the open house, but still would like to express ideas about the Community Cottages project, please contact Halley Fulford at 250 931-4663 or email her at info@ssilandbank.com. 1. Submit a rezoning application to the Trust for the entire island which will permit The Land Bank or, potentially, another similarly mandated non-profit to apply for a TUP with an expedited response from the Trust and will furthermore permit The Land Bank to administer and enforce a housing agreement entered into with the Trust and detailed in the TUP regarding the temporary nature and occupancy of the Community Cottages. B.2.2.2.21 (OCP): "The Local Trust Committee should consider changing local zoning to allow small care cottages to be temporarily placed alongside single family dwellings to accommodate those who are disabled or require family care... should the Committee amend zoning in this way, it should first have a system in place that will ensure the suites or cottages will be used as intended..."
B.2.2.2.24 (OCP): "Local service clubs, non-profit organizations and others that provide affordable, rental and special needs housing are encouraged to develop projects in keeping with the policies in this Section [B.2.2]. Such groups are particularly encouraged to explore the potential for supplying a community pool of care cottages." B.2.2.2.25 (OCP): "The Local Trust Committee will support the establishment and work of non-profit community land trusts and other organizations for the acquisition of land for, and construction and management of, affordable housing units." Resources to help with forming and maintaining host and tenant partnerships. A brief overview of similar projects and organizations. A compilations of The Land Bank's and the greater community's projects and ideas. Interested in hosting a Community Cottage, living in one, or just putting in your two cents? These surveys will help us as we decide on policy for the program, and talk with the Islands Trust.